The Atlanta Public School’s held its regularly scheduled meeting on Monday. The full agenda can be accessed here and live stream video here. The following is a recap of actions taken or considered by the Board. Special Revenue Budget – $108 million – Special Revenues are down $12 million from FY15 due to lower other Special Revenues – Budget was passed as part of Consent Agenda. FY15 April Board Financial Report – no changes from last month – property taxes are lower than originally budgeted, but State revenues are higher and essentially offset each other. The CRCT Erasure Analysis Report released last month was reviewed – the Report identified approximately 1,825 students who are still in APS and who appear to have been affected by the cheating scandal. APS will create an Individual Learning Plan for each of these identified students. The Charter System Application was reviewed (see presentation here and application here). The only amendment to the plan that was considered is to give the high school student representative on the Local School Governing Team a vote. Making this change will require some changes to the size of the LSGT and the Superintendent will come back with options on this matter. The Application was passed unanimously and will be filed with the GA DOE by June 30. During the Superintendent’s Report, she noted that the FY15 graduating class has increased from 1,775 to over 2,250 this year – a 26% increase. See more on this here. The Charter System Application – see notes on this above. Approved the Pension Obligation Bond (POB) referendum – see the presentation made by Board Member Jason Esteves here. The Resolution provides for calling a citywide vote on the issuance of the POB in November and provides parameters that APS will follow in the event the referendum is approved by voters. Several student appeals and personnel matters were reviewed in Executive Session. On all four items considered, the Board accepted the findings of the Commissions that had heard the matters. Four charter school petitions were denied for a variety of reasons – at least one of the charter petitions has been presented before and failed for the same reasons as in the past. A number of policies were updated to incorporate changes in the GA Statutes. The Human Resources Personnel Action Report was approved. See more on this here. The Capital Projects Budget – $6.2 millon – was approved. This Fund is essentially being phased out as building projects are now funded out of the SPLOST Fund. The Debt Service Fund Budget – $2.0 million – was approved. Nineteen contracts were approved – the contracts were primarily for maintenance and operations items and the extension of previous contractual relationships. Also included were contracts for software and curriculum services for Social and Emotional Learning, Instructional Management System and Image Director Content Management. A $10.5 million Construction Management at Risk Contract with Winter Construction for renovations at Boyd Elementary was approved. The Board will not convene in July and the next Board meeting will be held in August. During the Superintendent’s remarks at the regularly scheduled Board of Education meeting yesterday (see video here), Superintendent Carstarphen noted that over 2,250 students had graduated this year as compared to 1,775 graduating students last year. The increase of 475 or 26% is an initial indication that the graduation rate – that has remained in the 58-59% level for the last two years – will rise significantly. The graduation rate is based on the adjusted cohort of 9th grade students who graduate in four years. The FY13 and FY14 9th grade cohorts were 3,005 and 3,100, respectively. The FY15 9th grade cohort has to be vetted by the GA DOE prior to announcing the statewide graduation rates in October, but it is likely that the FY15 9th grade cohort did not change dramatically from prior years. If this is the case, then a conservative estimate for the FY15 APS graduation rate is likely to be in the 63-66% range – and maybe even higher. An increase in the graduation rate of 4-7% is very encouraging and is likely the result of changes implemented by the Superintendent during the year, including a focus on student attendance. In addition, the District is now looking closely at a large number of leading indicators that provide insight into the trajectory of student performance and retention and allow for quick intervention as needed. It is also important to note that during Carstarphen’s tenure as the Superintendent of the Austin Independent School District, graduation rates increased from 74.3% in 2009 (the year prior to her arrival) to 84.1% in 2013 – and the rate in FY14 is likely to increase by at least another 1.0%. This represents a greater than 11.0% rise during her five years in Austin. During that time, Carstarphen also focused on student attendance as well as many other initiatives that drove graduation rates up significantly across all demographics. As noted in yesterday’s post, APS announced the departure of four school principals. Toomer Elementary principal Nicole Jones has resigned and both Douglas High School principal Tony Burkes’ and Forest Hills Academy principal Anthony Howell’s contract were not renewed for next year. South Atlanta School of Law and Social Justice Principal Charlotte Davis has resigned after a district investigation into alleged improper grade-changing…Davis signed off on at least 39 grade changes last spring, grade-change sheets obtained by WSBTV show. But Davis changed many more grades — several hundred — in a school with about 300 students, according to WSBTV. All but one of the grades were increased to 70, the lowest passing grade. In some cases, the new grades allowed students who earned numeric grades as low as 8 or 9 to pass. The principal turnover rate continues to be high – 11.0% since August 2014 – but there has also been a process during which Superintendent Carstarphen has had to make some tough assessments and to get her team in place. With a full year to review principal performance, I would assume that the team in place now is the team Carstarphen believes will help her drive the changes she is looking for. The Atlanta Public School Board of Education will hold its regular monthly meeting today at 2:00 p.m. at the downtown central office. The full Agenda and supporting materials can be seen here. The meeting will be available on live-stream here. The appointment of Robert Morales as the new Chief Financial Officer. He currently serves as the CFO of the Fulton County School System and will start at APS on July 1. See more here. 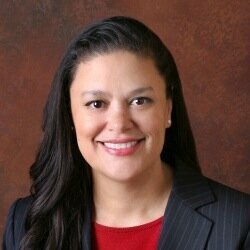 Erin Barksdale appointed as principal of the CS King YWLA 6-12 program. Rasheen Booker appointed as principal of Fain Elementary. Marvin Prior appointed as principal of Carver High School. Robin Robbins appointed as principal of DH Stanton Elementary. Dione Simon appointed as principal of Towns Elementary. Lincoln Woods appointed as principal of Connally Elementary. Douglas High School principal Tony Burkes’ contract was not renewed for next year. Forest Hills Academy principal Anthony Howell’s contract was not renewed for next year. South Atlant High School – Law principal Charlotte Davis has resigned. Toomer Elementary principal Nicole Jones has resigned. In addition there are a number of assistant principals and academy leaders that are leaving as the positions have been abolished. … the academic program in place is not positioning all students for college and career readiness. The current trajectory of growth across measures such as graduation, CCPRI, college matriculation, and state assessments is not sufficient to meet goals. District-wide and school level supports to address the complex challenges of a diverse student body are not sufficient to ensure all students can meet the mission. Data on foundational skills/school readiness, attendance, and retention, as well as disaggregated achievement data by subgroup, point to the need for revisions to the academic program. [Emphasis added]. What is also interesting about these bureaucratic assessments is that even if student achievement were outstanding, it would be possible to get a negative rating. As a rule, “check the box” assessments are a waste of time as they focus on process instead of outcomes. Charter System Application – the application will be voted on by the BOE today and then it will be submitted to the GA DOE for likely approval. This is a very meaty document and Angela Smith, who led the administrations efforts on this, has done an excellent job. If you want to see a very honest and comprehensive assessment of the District, read the whole application here. I have been a supporter of the Charter System as the preferred operating model for the District as I believe the model will serve to engage many more community members in the local schools as they serve on the Local School Governing Teams (LSGT). However, I am a bit dismayed about the final composition of the LSGT’s. I had thought that the LSGT’s would be similar to the Board of Education in that the members would be elected from the local community and would provide a diverse group of interested parents, teachers and community leaders. The key point is that the community would decide the composition of the LSGT in the same manner the community decides who will represent them on the Board of Education. Three instructional staff members from the school (elected by other staff members). Two community members recommended by the principal (ratified by LSGT). One swing member elected by the majority of the LSGT (this can be controlled by the five members above). Three parent/legal guardians elected by a majority of parent/legal guardian votes (one vote per family). The principal will be on the LSGT as a non-voting member – the same relationship the Superintendent has with the BOE. I will simply leave you with a few of questions. If the proposed LSGT structure is so good for local school governance, why not adopt the same structure at the Board of Education? How many Board members would vote for that? We trust the community to elect qualified, interested and concerned citizens to serve as Board of Education members – why are we not doing the same for LSGT members? See you at the meeting this afternoon. In a specially called meeting, the Atlanta Public School Board of Education unanimously passed a $685.6 million FY16 Budget. Over the course of the last several months, the Administration worked closely with the Board to establish spending priorities and ways to fund them. The close collaboration resulted in reaching an agreement that, for the first time in six years, all Board members supported. Nancy Meister, vice chairwoman of the board, attributed that to the work put into the document and a willingness from all sides to work together. “I’m proud of this work,” she said. “And I’ve told that to the community members who have asked me about it. APS will continue to fine-tune this budget as we finalize cluster programming needs, firm up staffing allocations, and develop more options for rethinking current resource allocations. Let’s start at the top of the budget and work our way down. Revenues are projected to be up $50.2 million or 11.8% over FY15. However, total available resources increased by only $28.0 million as the prior year included the use of $25.0 million of General Fund reserves. The current budget limits the use of General Fund reserves to $2.8 million. The revenue projection also includes $14.0 million in payments owed to APS by the Beltline, but the timing of when this amount would be collected is in doubt due to a dispute between the City of Atlanta and APS regarding the actual amount due. Overall, spending is up by $28.0 million as compared to FY15 and up $90.2 million or 15.1% as compared to FY14. 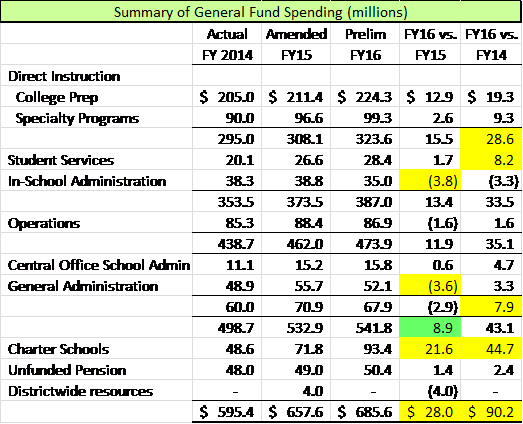 The chart below presents the major spending components for the actual results in FY14, the amended budget for FY15 and the FY6 Approved Budget (click to enlarge). The Administration’s detailed presentation by department is here. Specialty Programs – This category includes Special Education, Remedial Education Programs, Gifted & Talented, Vocational Education and Alternative Education. In total, these programs saw a $2.6 million increase in FY16 and a $9.3 million increase over two years. The entire FY16 increase was directed toward the Special Education programs that saw a $3.1 million increase in FY16 and a $6.4 million increase over two years. There has been a slight increase in students qualifying for Special Education services in FY15 and, based on the enrollment (with a one-year lag) the spending per qualifying student has increased from $21.7 thousand to $22.7 thousand in the General Fund. In addition, the funding for the Remedial Education programs remained flat as compared to FY15, but has increased by $2.4 million over two years. Student Services – Social Workers, Nurses, Psychologists, Counselors and Student Support Teams departments increased by $1.7 million in FY16 and $8.2 million over the last two years. The primary driver of the cost increase is related to the Student Support Teams implemented in FY15 and expanded with additional administrative resources in FY16. In-School Administration – Expenditures for In-School Administration – principals, assistant principals, graduation coaches, registrars and school secretaries – came down by $3.8 million as compared to FY15. A total of 37.5 positions were cut as the “small schools” initiatives have been closed down. Included in the positions cut were 18 principles and academy leaders, six assistant prinicpals and 11 graduation coaches. Central Office School Administration – This function increased by $600 thousand over FY16. The primary driver of the cost increase was the transfer of costs from the Special Revenue Fund to the General Fund for professional development over the course of the last two years. It is also clear from the many other increases and decreases in specific departments that the administration is making changes in this area and there may be more reallocation of resources from this function as time passes. General & Administration – Expenditures budgeted for the General Administration functions – Board, Superintendent, Deputy Superintendent, Finance, Audit, Legal, Human Resources and Information Technology – decreased by $3.6 million or 6.5%. Nearly all the departments reduced their spending with Finance again leading the way with a $1.4 million reduction and IT with a $1.0 million reduction. In addition, there were some savings found in certain district-wide employee benefit accounts in this category. Charter Schools – Charter school spending is up substantially over FY15 and FY14 due primarily to both increasing local property tax revenues and continued increases in enrollment. It is estimated that the FY16 enrollment in the charter schools will be approximately 16.2%. As in all budgeting negotiations, there has to be compromise within the boundaries of limited resources. The Board and Administration worked hard to make the necessary compromises and reach a unanimous agreement on the next year’s budget. As such, there are a number of items that were identified as priorities by both the Board and the Administration that did not get funded. However, my sense is that additional adjustments are still to come and it is likely that additional unfunded priorities will find a place in the budget before it is complete. I will follow-up on this post with more detail regarding specific departmental expenditures and departmental and functional staffing.